This bread will fill your house with a delicious aroma and your body with the nutrients it needs. Whole wheat flour is an excellent source of dietary fiber, which enhances the functions of the digestive tract and keeps the digestion smooth and regular. It also helps reduce the risk of heart disease by regulating cholesterol levels. 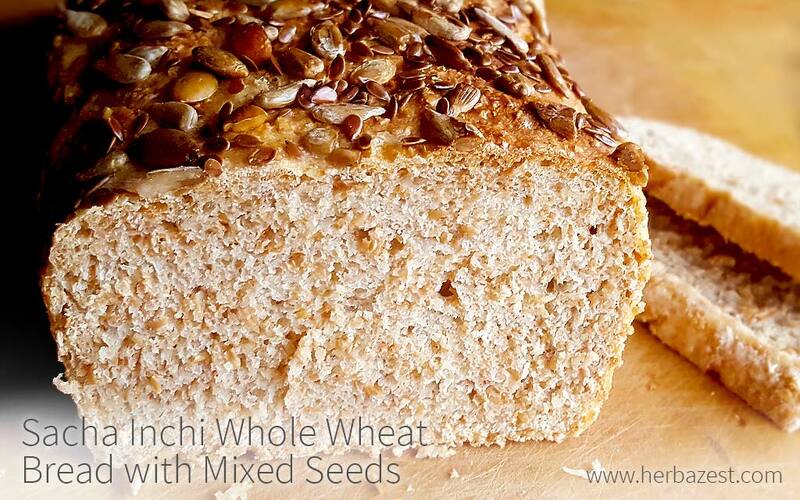 Sacha inchi adds a good dose of complete protein to this delicious bread, which will keep you full for longer while helping you maintain a healthy weight. Besides crunchiness, a mixture of pumpkin, sunflower, and flax seeds also gives this recipe an injection of essential vitamins and minerals for optimal health. Once baked, take it out of the oven and let cool completely. Enjoy! This sacha inchi whole wheat bread can be a nutritious base for your healthy sandwiches, especially when topped with a homemade maca hummus, basil tomatoes, garlic guacamole as well as drunken prune jam and goldenberry jam.